Last year I was asked to provide some input into the inaugural running T184 Endurance Run from a runner’s perspective. I’ve subsequently had a few chats and discussions with Shane Benzie the Race Director and have started to see the event take shape. It’s been interesting to see and hear of some the organisation that goes on behind the scenes when looking to stage an ultra running event from simple challenges of working out the race logistics to areas such as planning, obtaining insurance, seeking relevant permissions, working out the rules of the race and many many more things. As part of the build up to this event Shane wanted to organise a workshop day where different speakers would be invited to talk about different aspects of the race, discuss ideas and hopefully help prepare runners for both the T184 Endurance Run and the T60 Night Race which sounded like a great idea. He then asked me whether I wanted to do a talk on the mental approach to running a long distance event and kindly pointed out that I had some relevant experience with the GUCR, Thames Ring and Spartathlon last year all of which were long distance events with 50% finish rates of which I managed to come within that finishing 50%. Before I got too many delusions of grandeur, he also pointed out that I was quite “normal”. I had a job, family, bills to pay and running was a weekend hobby for me with training fitting around work and family life. My results in these races weren’t stunning in any way and people who were thinking of undertaking the T60/T184 could relate to me as I was just the same as everyone else who lines up in the middle of the pack at the start of the race. I think I’m flattered but not too sure! Having suggested that I may have some insights to offer from a normal runners perspective I started to think about what the hell I was going to talk about. My initial approach to long ultras was to start in good spirits, run, grumble, jog, grumble, walk, grumble, crawl and eventually get to the end. Surely, there’s got to be a bit more to it than that? 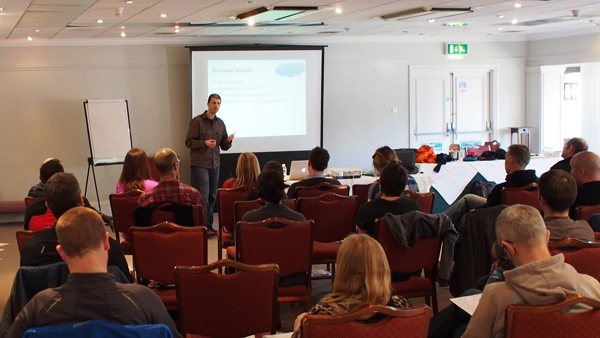 Therefore, I started to think a bit more about my own personal approach and started to note down the things I did before, during and after a race and so a presentation started to take shape, this was eventually delivered to a group of runners at the T1 Workshop. I think the T1 Workshop was a success, we had 40+ people attend the session and it was a great opportunity for people undertaking the T60 or T184 to start to get together. The day started with Running Reborn Coach & T60/T184 Race Director Shane Benzie talking about kit requirements for the T60/T184 and this was run as a workshop type session with everyone contributing some thoughts and ideas including a demo of the WAA Ultra Bag from Dave Cox. 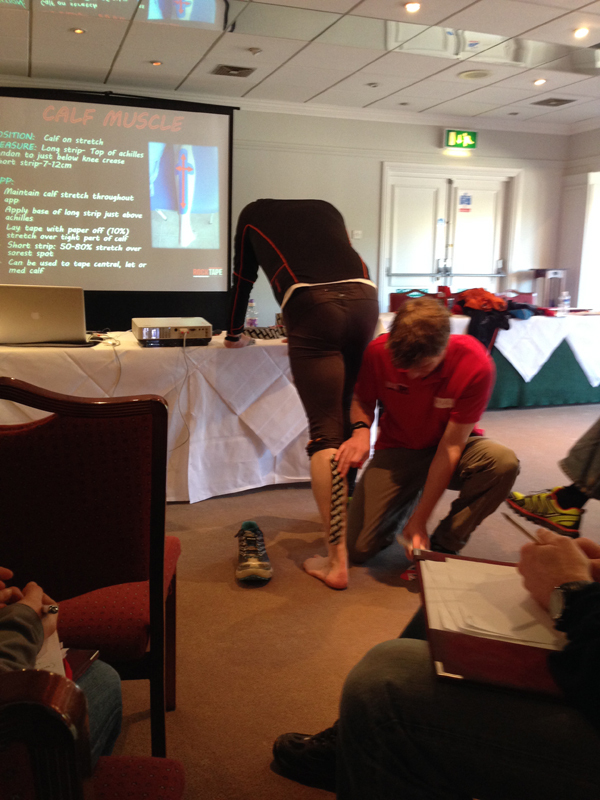 Paul Coker, Medical Director from Rocktape then gave an interesting talk on the use of tape covering the reasons why we tape (pain relief, reduce swelling, posture control and normalising activity to delay fatigue, improve coordination and optimise injury recovery rates) which also included some practical demonstrations. Dave Annandale from Extreme Adventure Foods then talked about nutrition and the use of freeze dried foods which will be appropriate for the T184 race and kindly organised a sample of the various types and flavours of foods for lunch. From the comments afterwards, people were quite surprised with the quality and taste of these foods. After lunch I gave a talk about “Managing the Mindset” during long endurance races touching on my personal experiences of a few of last years races before Cliff King gave a presentation on footcare including some lovely pictures of peoples feet (Nici Griffin would be proud). Chris Forrest then gave a talk and practical demonstration on the GPS technology which will be used on the T60 & T184 events including live tracking of Paul Stout as he nipped outside for a quick pint and to buy his lottery ticket! Finally, Shane wrapped up the day with a talk on training and preparation. I hope everyone found the talks useful and that found the opportunity to ask questions and make their own observations was useful. For those who attended the discussion, I hope you all end up in that finishing 50% I talked about! For those people who are interested in looking at the full PowerPoint presentation and ignore any of my writing you can find this here. However, for those who prefer good old fashioned blog then I’ve written the key highlights of the presentation below. 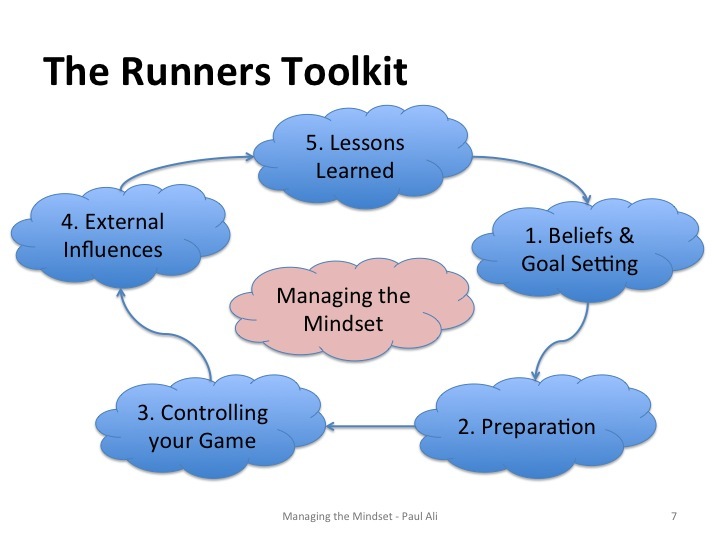 I need to preface this blog with the comment that I’ve covered of the things I do to help “manage the mindset” before, during and after a race. and I believe this is very much a process which starts months before the race with your preparation. These are the things that seem to work for me but I accept people are different and have different approaches so I certainly don’t claim this is the right way or the only way. Hopefully, if people read this and pick up one or two points to consider then this has been of some use. 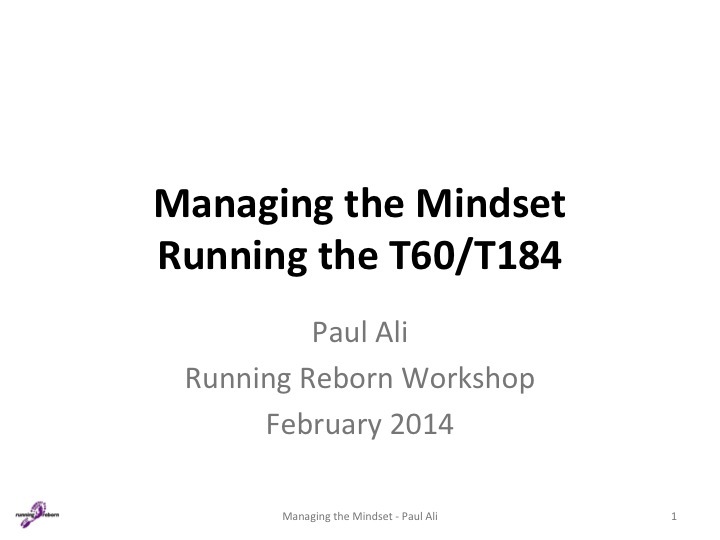 The presentation was designed to help runners prepare themselves mentally for undertaking the T60 & T184 races by relaying my own experience and perspective from the middle of the pack viewpoint. This is very much a personal experience and the only expectation is for people to at least consider their mental preparation aswell as their physical preparation for an event. How important is mental toughness? An often-quoted ultra running phrase is “the first half of the race is physical and the second half is mental”. Does this mean mental toughness accounts for 50% of your performance? Probably not. I did read an article on Runners World referencing a recent study by a psychologist Jon Hall undertaken in late 2013 which suggested that after some scientific study (I don’t think the study hasn’t been published yet so let’s consider this theoretical) that mental toughness accounted for 14% of an athletes performance The link to the article is here. The answer is we may not know in percentage terms how much this assists our performance but consider how much benefit a 1%, 5% or 10% improvement can have and it’s definitely something to think about. From my perspective, if I can motivate myself to run a few more hours than I walk, then that will save me a significant amount of time in a race. When considering this area and my personal approach, two key themes were evident to me which governed my overall approach and two quotes summed up these themes. The former quote is really about keeping a positive mindset and I’ve seen reference to studies suggesting that runners experience less physical discomfort when they are motivated. The latter point for me sums up your approach to a race and you should always try and break everything down into small simple manageable steps. A final point I should add is that no amount of “mental training” can overcome a lack of physical training! So if you think you can skip the hard yards and convince yourself that you are mentally strong enough to give a 500% effort during a 184-mile race then good luck with that! At the moment, I’ve just talked about theory but you are probably wondering what are the actual practical steps you take and what are the specific things you do? I had to really sit back and think about this and I broke this down into 5 areas which are detailed further below. There’s nothing really new or innovative here and you could consider all of this to be just “race experience”. · Can I complete the race? · How did other people complete the race? · Do people think I can complete the race? · What do I need to do, to complete the race? Taking part in the Spartathlon event last year was a great example. I looked at the race details and cut-offs and thought it was do-able for someone of my level of ability and having that inner belief was a positive first step. If you approach this on the basis that “I don’t think I can do it but will give it a go” then to my mind you are on the back foot from the start because you’ve already created some doubt in your own mind. I then read every Spartathlon blog I could find from those who finished to those who did not to learn what I could and then spoke to a few friends and other running buddies who had participated in the event and quizzed them for any tips and advice following which I had enough information to formulate a training plan and identify areas I needed to focus on (long runs, heat management and hills to combat the rolling terrain). I also asked people (running contacts) whether they thought I could do it. You need to dismiss the ones that comeback with the “Yeah, no problem you’re awesome” as they are of no real benefit. Strangely I didn’t get any of these! The feedback that is of the most use is the advice from people who say, “Yes, you could do it but you need to do this and consider this”, This is the sound motivational advice you need in the long months ahead of the race. It’s fair to say a few people were honest enough to say “I don’t think you will do this first time”. Again, that advice can be used as a motivational tool to prove them wrong (and not in an unkind way at all). The next think I think about is my goals for a race. Is it just to finish, do I have a time in mind. I normally have “A”, “B” and “C” goals with my “A” goal my dream finish time, my “B” goal is my expected finish time and my “C” goal is my minimum acceptance criteria (i.e. just finish). I will have a think about this at the start of my build up to the race as this sometimes helps me motivate during the week after week of training. 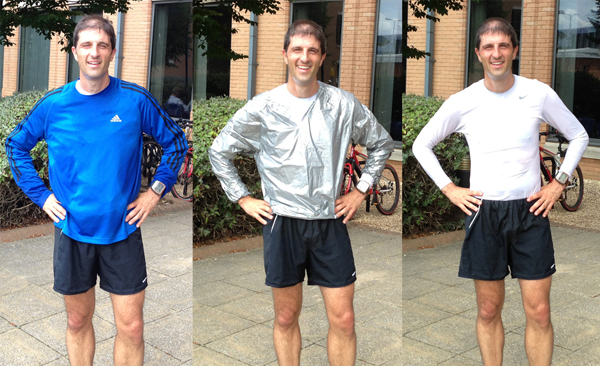 The 2013 GUCR (a 145 mile run from Birmingham to London) was my main buildup race for the Spartathlon. My previous GUCR best was a 38-39 hour finish which frankly wouldn’t cut it in Greece and I wanted to bank a run where I knew I would be within the Spartathlon cut-offs. I therefore worked out an “A” goal of a 32 hour finish, a “B” goal of a “34 hour” finish and a C goal of well just finish. Whether you choose to make these goals public is up to you, I’m a classic case of under promise and over-deliver by my moderate standards. Other people like to take a bolder approach and tackle this on a “do or die” basis (I perceive runners like Robbie Britton and Allan Rumbles taking this approach). I will typically keep my “A” goal secret as it’s a dream goal and not likely to be achieved, make my “B” goal public and try and run at a “B+” pace so I create an impression (and convince myself) that I’m having a good run as I’m ahead of my public target. I work in the Insurance industry so I guess it’s natural for me to take a risk averse and cautious approach! · Good training breeds confidence. · Consider which areas you need to improve and work on these. · Recce the route if you can as it can remove the doubt over getting lost or losing time. All of these points help build confidence and remove doubt and are adding little layers of strength and resilience to your mental state. This is a pretty subjective area. Some people have an idea of a time in their head and just go for it, others spend hours slaving over an excel spreadsheet in the evenings tweaking pacing strategies to work out your optimal plan. I’m in the latter category so will add a few points here. For me a race plan helps me break the race down into manageable steps (i.e. checkpoint to checkpoint) and links back to one of the key themes about keeping things small and manageable. It helps me mentally rehearse the race and develop contingency plans as I ask myself questions like “When will it be dark, When will I need my head-torch, What kit will I need when? When/where should I meet my crew” Obviously, depending upon the nature of the race (i.e. whether it’s supported, unsupported or are drop bags available) will influence whether you take any specific actions here. This helps you answer these questions in advance and during a race, having some form of plan also helps break the race into manageable segments allowing you to focus on the next task or checkpoint/drop bag/meeting point. I’m no expert on this area but can honestly say as soon as I signed up for Spartathlon it was the only race that year I actually thought about. When I was out on a grotty miserable long run by myself on a Sunday and started to feel demotivated I kept picturing myself running along the high street in Sparta and imagined myself racing to the Statue of Leonidas and kissing the foot to the adulation of the crowds (in reality I limped and hobbled my way to the end but it allowed me to make the most of the crowd support). For me, visualisation helps create a positive mental image and attitude towards the race and motivates me during the build up towards the race. It’s the answer to the question “Why am I doing this?” you keep asking yourself week after week in training. So hopefully the training has gone well, you’ve hit your training goals and it’s a couple of weeks before the race and time to taper. It’s not uncommon for people to start to suffer those phantom niggles day before a big race or start to doubt themselves a little before a big challenge. I don’t usually take advantage of sports massages largely due to the cost and partly because I don’t help myself with a lack of a stretching routine anyway but very occasionally I will book a sports massage for the physical benefit and to mentally dismiss any phantom niggles and say to myself well I’ve had a sports massage so there’s no reason for my legs not to be fine. For big events, I also look back at my training and see what I have achieved and compared this to previous races. 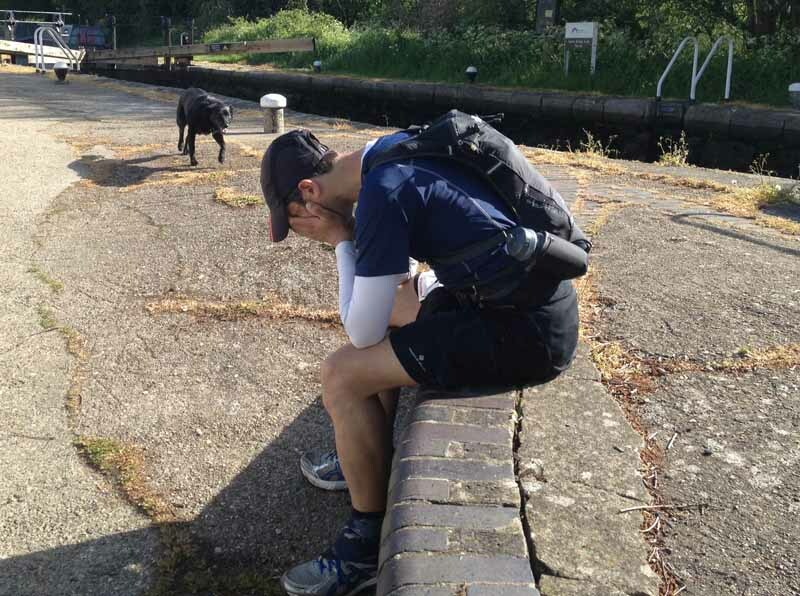 The GUCR is a good example where I blogged here about my build up and looked at the factual evidence which showed I had ran more miles and achieved slightly better results in comparative build up races. Physically I was fitter, I just needed a little prompt to remind my mind of the fact aswell. So it’s the day of the race itself and you are standing on the start line. It’s not uncommon for people to start to feeling nervous when faced with a big challenge. You may also start looking at everyone else around you who look fitter/taller/healthier/lighter/have more expensive kit and start doubting yourself. You may even start develop an irrational fear (i.e. kit failure). I recall standing on the start line of the GUCR last year and witnessing someone change their clothes three times before the race (jacket on, jacket off, shorts or leggings?) and thinking to myself, is this person doubting themselves? A pre-race routine to take your mind of this may help such as stretching or warming up as it gives you something to do. You may even do your own kit check to satisfy yourself that you’ve not forgotten anything. It’s also useful to try and project an image of confidence and control by smiling, chatting, relaxed breathing, or even engaging in casual conversation with others. I always look forward to catching up with people before the start of the race as I may not have seen some friends for months. It’s almost a disappointment when the race starts and people go off at their own pace. The point being here is that my mind is occupied with another task and not worrying about the race. Let’s assume the race has started, the excitement of the initial few miles is out the way and the hard graft starts. I personally find I have little low points quite early in the race (20-30 mile points) as your body starts to realise this is not a long training run and we’re going a little further today. · Firstly, try and focus on something (be it the next checkpoint, milestone, meeting point or goal) and don’t gradually descend into a negative state. · Practice self-talk, encourage yourself, chat with competitors, share a joke or some banter, moan in typically British fashion about the weather/conditions/terrain/getting lost and show some stiff upper lip in not letting it overcome you. There will always be runners who unfortunately have to DNF. If that’s you on the day then make sure it’s for a reason you can justify the next day (i.e. a broken leg!) I’m not going to consider physical reasons for stopping here and just consider the mental process. · What’s the impact of failure? · What do I tell my wife/daughter/family/friends. How will I ever show my face on Facebook or Twitter ever again? · How will I feel about having to admit to quitting a race? Can I take (the justified) good natured ribbing after the race? · I ask myself, why I am quitting? Is there no way I can turn this around? If my life depended on it, could I make it to the next checkpoint? I don’t wish to make this sound like it took a superhuman effort to turn it around in this example, as I shouldn’t have let myself sink into this stage. I’m trying to say you should remain vigilant at all times and seriously consider the implications. Essentially, could you have made it if your life depended on it? Will you regret this decision the next day? Everyone is going to suffer aches, pains and niggles during a long run. Sometimes it’s helpful to go through that mental health check periodically to help convince yourself that you can continue (“Are your legs ok? Check, Are my feet ok? Check). If you are experiencing an issue (lack of food, blister, minor niggle) what is your logical response? If you’re tired you eat, if you have a blister you address it. You then start to answer your own problems and move onto something else. This section is about breaking a race down into simple manageable steps, milestones or goals. If you think about the length of a long distance Ultra (be it 50 miles, 100 miles, 145 miles or 248 miles) then it can overwhelm you when you consider the consequences of being out on your feet for hour after hour. By breaking a race down into checkpoint stages or meeting points you can just focus on the next goal. Can you make 10 miles? Yes. Once you’ve achieved that then worry about the next 10 miles and so on. Keeping questions, issues, milestones or challenges short and simple makes it more achievable. All you are doing here is breaking everything down into one question, one issue, one goal and focusing on that next step. Think about giving yourself rewards at each milestone. I personally try and avoid use of my iPod during the first half of the race and save it as a reward before the night leg on an overnight run. You may even pack some simple pleasure foods at a drop bag as an incentive to get somewhere. Firstly, concentrate on your own race plan and not anyone else’s. If you have a plan and then change it to match someone else then you may start to put yourself outside your comfort zone. (You could ignore this if you are at the sharp end of the field and “racing” then you may need to adjust your plan all the time). Having an A, B and C goal may help if things start to slip. Can’t achieve plan A? No worries, I will follow Plan B pacing. Don’t judge competitors or let them influence you (again you may ignore this if you are “racing”). It’s quite easy to turn up at a race and start to rank the runners based on their previous experience and you then start to conform to a pre-judged outcome. Good runners have bad days, average runners have good days. However, using other competitors can be motivating on a run. This could be from a competitive viewpoint (i.e. I’m going to try and win the race today) to those who may spot someone ahead and use that as motivation to catch up with them and have some company. Buddying up with people can be great to help you get through a race and keep each other motivated or distracted or just have someone else to suffer with! You should try and use positive influencers such as phoning/texting/tweeting/Facebooking family and friends if you need to (the speedsters may not have time for this). You should try and avoid the negative influencers (i.e. Those people who are having a bad day and want to tell everyone about it). Unfortunately, I went into last years Caesars Camp 50 with a negative attitude as it took place shortly after a previous race and I convinced myself I would be fatigued. I spent 2.5 laps moaning about how fatigued I felt to find people running away from me before I had a change of attitude and realised I was being that person! I then got my head down and cracked on with the rest of the race to finish in a not unreasonable time (for me). Hopefully you have survived the race and got to the end, congratulations. There are a couple of final things you could think about to complete the loop and prepare yourself for your next challenge. Firstly, relax and reward yourself for a job well done. You may have spent weeks or months training for an event and you deserve a few days off to rest and relax. Training doesn’t have to start immediately (admittedly I’m not great at doing this). Secondly, spend a bit of time reflecting on the race and ask yourself “What went well? What could be improved?” Blogs are great for recording these thoughts and its useful to re-read an old race report to pick up a few tips the next time you do the race from something simple like recalling a navigational error to the wrong shoe choice to foods which seemed to work well or not so well. Every race is a learning experience and due to the variety of factors at these events (from your fitness, the distance, terrain, conditions etc.) there are always things you can tweak and improve. · Performance can be improved when your mental state is positive so its something to think about. · Mental toughness can be practiced but takes time to develop. You can’t just switch it on. · Focus on being positive and do everything within your power to avoid those negative thoughts. · Keep it simple and break everything down into small logical steps. · This is not a rigid process so you need to retain some flexibility with your plans and tweak and adjust as necessary from race preparation to tactics and approach during a race. As I’ve mentioned previously, this is my personal approach and something which has helped me during my preparation and during long distance events but I accept that different approaches work for different people. I hope as a minimum this has got people to at least thinking about this area more, if you have any comments or feedback on this blog then please let me know. It would be interesting to hear what other people think on the subject. Ps Paul, I’m still smiling after your story about the bat mobile!! This is great advice. I just completed my first ultra (46+ miles) and so much of this rings true for me! I will reread before my next race. Thanks! Glad you’ve enjoyed the blog and found it interesting guys, thank you. A very well written piece, big help! Very good post. I always go with the idea “If my life depended on it, could I make it to the next checkpoint?” as you mentioned about quiting.